Is Glover becoming the most famous Donald in the world? In the same week that his fans reclaimed ‘TheDonald’ Reddit page from the ‘other one’, Glover pulls out this style move. It’s very new wave Alain Delon in its structure – those loafers, that knit polo, the soft pleated trousers – but with modern touches like the outrageous pair of Ozzy Osbourne-esque shades. It all works by employing varying shades of the brown base colour, so he doesn’t blend into the pavement behind him. The adage ‘all eyes were on the bride’ does not apply if you foolishly invite 43-year-old former footballer David Beckham to your wedding. Not only is the short military crew cut and light stubble on point, but the suit – a first look at Kim Jones’s Dior, by the way – fits like a glove. There’s no unsightly bunches on the trousers or shoulders, and the grey double-breasted waistcoat is a classy touch worthy of his playing days, breaking up the all-blue. Along with Becks, all manner of people were invited to the Royal Wedding on Saturday including coffee machine salesman (and occasional actor) George Clooney. And as is the way with George he looked positively dashing alongside his wife, Amal. Matching her yellow in the stripes on his tie and handkerchief, his suit is a classic, one-button two-piece replete with peaked lapels, and is well-matched with black shoes, as it should be. Actor and singer Nick Jonas knows how to dress for the red carpet, but when he’s out on the streets he looks the part too. Wearing a jumper from streetwear brand Aimé Leon Dore, he’s hitting the millennial pink and the logo tee (or sweatshirt) trends. Any more colour would be overkill, so black jeans and white sneakers temper the outfit down nicely. Former Glee star, now deadly serious actor after a turn in American Crime Story, Darren Criss is a snappy dresser who has been popping up quite a bit on our radar of late. Here, his all-black outfit looks nipped and tucked in all the right places until, that is, you get hit by that bolt of lightsaber blue across the lapels, showing a real touch of artistic flair. Whether he was supposed to take that Dior label off the jacket cuff is another matter though. 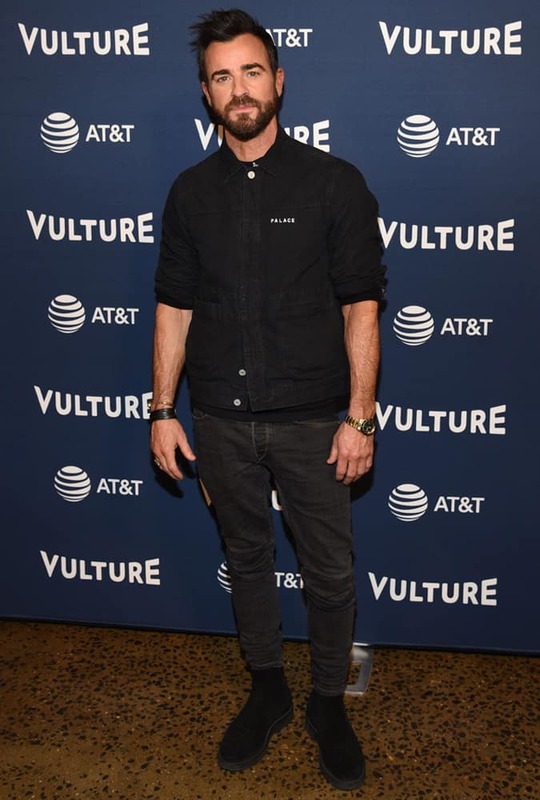 If you’ve ever wondered whether you can still be a hypebeast well into your 40s, let actor Justin Theroux show you how. Cult streetwear label Palace is the place to start, with pieces that range from the absurd to the surprisingly wearable. On the latter end of that spectrum is this black denim worker jacket, which Theroux gives some rock ‘n’ roll edge with a sleeve roll, black skinny jeans and Chelsea boots. Rapper 21 Savage is not 21 anymore so that joke has passed, but his outfit choices are, in slang terms anyway, completely savage (which is good by the way). The ostentatious red check trousers need to stand as the centrepiece, so could do without other items competing too much. The chunky trainers are at risk of doing this, but are less showy than other versions on the market, while the white shirt and black denim jacket only seek to further complement the trousers – even with the patches adding an arty flourish. Through the 30-odd years that Hugh Grant has been in the public eye, his style hasn’t seen any major change-up from the quivering English gent in a black blazer and a white shirt. But there’s no need to change a habit of a lifetime when it works for you, and Grant keeps the look going into his late 50s, albeit now with an on-trend suede field jacket. Paired well with his brown shoes, this is how you should keep your style in check past the golden years. While we expect teenage sensations to be en vogue, when it comes to timeless style we usually leave that to the older gents. But 19-year-old singer Shawn Mendes is sporting a look for the ages here with a Prince of Wales checked suit, albeit with a modern cropped trouser hem that highlights his exquisite boots. We’re also a fan of the twin shirt combination – the grandad collar underneath allows him to pop some buttons on the outer shirt for some added roguish swagger. English actor Gregg Sulkin made his name as a teenager in the Disney channel show Avalon High but this outfit sees the boy become a man. His MA-1-style bomber jacket complete with a jagged stripe across the chest is a bold but welcome look. It borders on statement, so if you want to replicate it, make sure the rest of your outfit, like Sulkin’s, is clean and neutral for an ensemble that is both youthful and assured.